Weird, huh? So here’s the output of the naviseccli command that will give you the same information, but with a text-only feel. 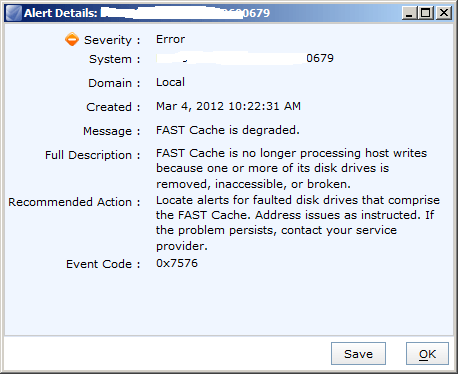 So what’s with the degraded cache? 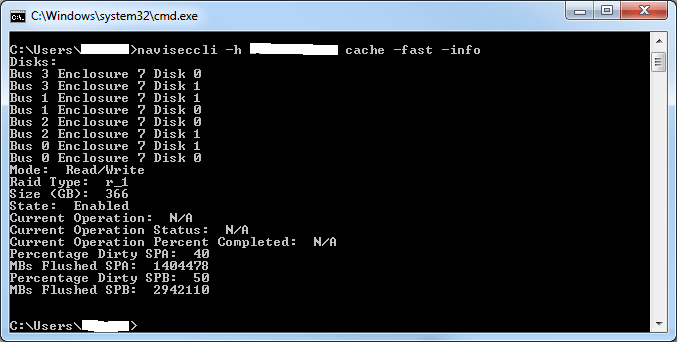 The reason for this is that FAST Cache stores a small database on the first 3 drives (0_0_0, 0_0_1, 0_0_2). 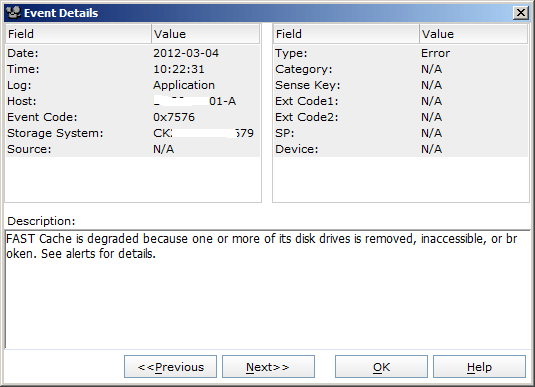 if any of these disks fail, FAST Cache flushes to disk and goes into a degraded state. But it shouldn’t, because the database is triple-mirrored. And what does it mean exactly? It means your FAST Cache is not processing writes at the moment. Which is considered “bad darts”. This is a bug. Have a look on Powerlink for emc267579. Hopefully this will be fixed in R32 for the VNX. I couldn’t see details about the CX4 though. I strongly recommend that if you’re a CX4 user and you experience this issue, you raise a service request with your local EMC support mechanisms as soon as possible. The only way they get to know the severity of a problem is if people in the field feedback issues. Someone on twitter asked me about a white paper they were reading on the EMC site recently that suggested that LUN expansion or shrink operations would require that FAST Cache be disabled. The white paper in question is located here. For those of you loitering on Powerlink the EMC Part Number is h8046.7. In any case, on page 8 it covers a number of requirements for using FAST Cache – most of which seem fairly reasonable. However, this one kind of got my attention (once my attention was drawn to it by @andrewhatfield) – “Once FAST Cache has been created, expansion or shrink operations require disabling the cache and re-creating the FAST Cache“. Wow. So if I want to do a LUN expansion I need to delete and re-create FAST Cache once it’s complete? Seriously? I informally confirmed this with my local Account TC as well. 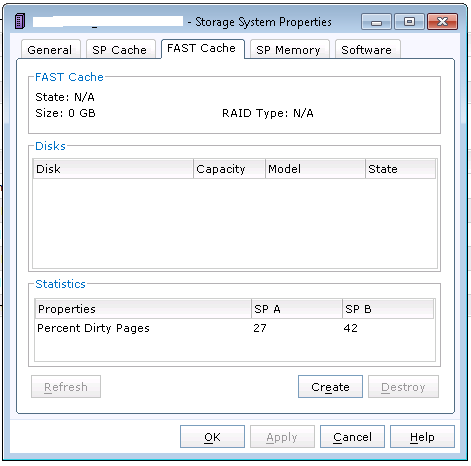 It takes a while to create FAST Cache on a busy VNX. It takes even longer to disable it on a busy system. What a lot of piss-farting around to do something which used to be a fairly trivial operation (the expansion I mean). Now, I’ll be straight with you, I haven’t had the opportunity to test what happens if I don’t disable FAST Cache before I perform these operations. Knowing my luck the damn thing will catch on fire. 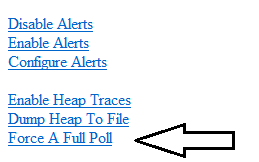 But it’s worth checking this document out before you pull the trigger on FAST Cache. I’ve got a bunch of graphs that indicate you can do some bad things to EFDs when you run certain SQLIO stress tests against them and compare the results to FC disks. But EMC is pushing back on the results I’ve gotten for a number of reasons. So in the interests of keeping things civil I’m not going to publish them – because I’m not convinced the results are necessarily valid and I’ve run out of time and patience to continue testing. Which might be what EMC hoped for – or I might just be feeling a tad cynical. What I have learnt though, is that it’s very easy to generate QFULL errors on a CX4 if you follow the EMC best practice configs for Qlogic HBAs and set the execution throttle to 256. In fact, you might even be better off leaving it at 16, unless you have a real requirement to set it higher. I’m happy for someone to tell me why EMC suggests it be set to 256, because I’ve not found a good reason for it yet. Of course, this is dependent on a number of environmental factors, but the 256 figure still has me scratching my head. Another thing that we uncovered during stress testing had something to do with the Queue Depth of LUNs. For our initial testing, we had a Storage Pool created with 30 * 200GB EFDs, 70 * 450GB FC spindles, and 15 * 1TB SATA-II Spindles with FAST-VP enabled. The LUNs on the EFDs were set to no data movement – so everything sat on the EFDs. We were getting kind of underwhelming performance stats out of this config, and it seems like the main culprit was the LUN queue depth. In a traditonal RAID Group setup, the queue depth of the LUN is (14 * (the number of data drives in the LUN) + 32). So for a RAID 5 (4+1) LUN, the queue depth is 88. If, for some reason, you want to drive a LUN harder, you can increase this by using MetaLUNs, with the sum of the components providing the LUN’s queue depth. What we observed on the Pool LUN, however, was that this seemed to stay fixed at 88, regardless of the number of internal RAID Groups servicing the Pool LUN. This seems like it’s maybe a bad thing, but that’s probably why EMC quietly say that you should stick to traditional MetaLUNs and RAID Groups if you need particular performance characteristics. So what’s the point I’m trying to get at? Storage Pools and FAST-VP are awesome for the majority of workloads, but sometimes you need to use more traditional methods to get what you want. Which is why I spent last weekend using the LUN Migration tool to move 100TB of blocks around the array to get back to the traditional RAID Group / MetaLUN model. Feel free to tell me if you think I’ve gotten this arse-backwards too, because I really want to believe that I have.